After nighttime diaper changes and feedings, and once the last parent has left to return home for rest, Santa’s elves are hard at work behind the doors of the Peggy V. Helmerich Women’s Health Center neonatal intensive care unit (NICU). With the precision of an IV start and scissors in hand, they carefully cut through card stock, dab glue sticks and place shapes of hats, stars and gingerbread men. They are ready for the final touches that make their work one-of-a-kind each and every time, as they pull back blankets to reveal tiny, warm fingers and toes to dip in red and green paint. They are Santa’s elves donning scrubs and a passion for caring for Hillcrest’s smallest patients, spreading the spirit of the holidays amid beeping monitors and the bright neon blue cast of phototherapy bulbs. Handmade for each baby’s family, the NICU night shift nurses spend several nights creating the custom cards. Any given holiday, they may have 30 or more cards to make.”These cards are a lot of work, but are a special memory that we get to give each family,” says Joanie. The morning of Christmas Day, Joanie, Misty and the NICU night shift nurses will have completed their shifts, leaving behind these gifts made with love next to each baby awaiting their parents’ soon return. “I love hearing about their reactions to seeing the cards and seeing their posts on social media about how much they meant to them,” adds Joanie. “I like to think these parents will treasure these forever,” says Misty. 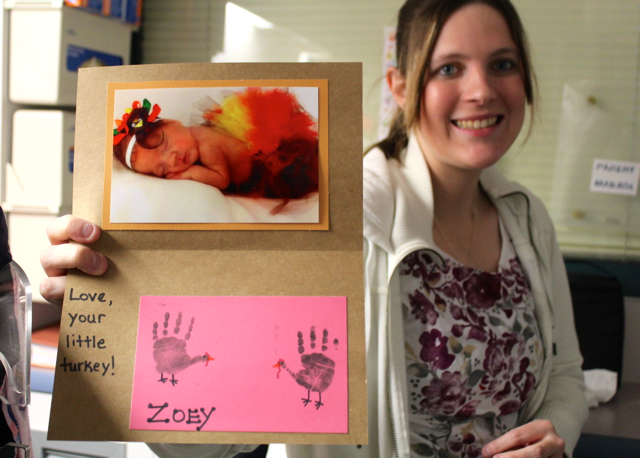 Bottom photo: Kaitlyn Timmons holding the card she received when her daughter, Zoey, was in the NICU over the Thanksgiving holiday in 2013.